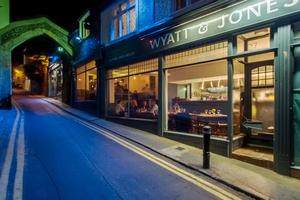 Opened in 2013, Wyatt & Jones is an independent, family run, high quality British restaurant offering a wide array of seasonal food with a take on the traditional. We’ve seen (and smelt) first hand as they’ve baked their breads and smoked the fish and trust us, it’s a trip worth making. Three award finalist positions attest to the quality of food you’ll find here. For this shoot we visited three times; once to meet with the lovely Melody (PR/Marketing and Restaurant Manager), once to get an evening photography perspective with the restaurant busy (which is is most of the time) and finally to set up and photograph a selection of plates (dishes) from the menu. On this last shoot we had the pleasure of meeting and working with Jan and Kat (the Wyatt and the Jones) owners and culinary visionaries for this great Broadstairs restaurant. Of course, not forgetting the kitchen team who prepared the plates to perfection, waiting until we were ready to shoot to finish each one. 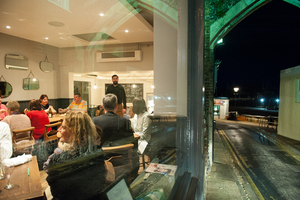 Due to its location on Harbour Street, Broadstairs - a road that slopes down to the beach - the restaurant is set over three levels. It’s actually quite a long premises but thanks to the levels and layout it has an intimate and private feel. This and the amazing frontage of glass which looks out directly onto Broadstairs beach. The atmosphere and ambience at Wyatt & Jones is rather calming. With an understated but classy decor it’s very much a restaurant that leaves it to the food and the patrons, to do the talking. On visiting you’ll find yourself with a sold wood floor under foot and typically rustic but well finished matching wood tables (lovingly cared for by the beeswaxed hand of Mr Wyatt). As you’ll see from the images in this food photography photoblog the presentation of each plate was immaculate and it’s a real pleasure to work with chefs that can deliver such high quality plates of food to a hungry but artistic creative commercial photographer. To view the a gallery of these photoblog images click here.